PROVENCE PRIVATE TOURS FROM MARSEILLE, TOULON OR ANYWHERE IN PROVENCE. Customize your Provence private tour with our assistance. Include wine tasting, or add visits to other towns. Inquire. Provence Private Tours Include: Private transportation and English speaking tour guide, taxes, tolls and parking. Note: Best to visit these towns on Tuesdays, Fridays, and Saturdays (market days). 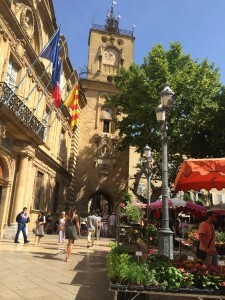 On this Provence private tour, your English-speaking tour guide will take you to discover the charms of Aix en Provence. Founded by the Romans in 103 B.C., the city was invaded and damaged by the Barbarians, yet still managed to stay prosperous. At the end of the 12th century, Aix en Provence became the capital of Provence. You will no doubt enjoy your private tour of the vibrant Aix en Provence, appreciating the sumptuous architecture from the 17th and 18th centuries, as well as Aix’s markets and cafés, mansions and fountains, and lively streets and lovely stores. Aix en Provence was also the birthplace of the painter Cézanne; your tour guide will take you in his footsteps to see Mt. Sainte-Victoire, one of his favorite subjects, as well as his studio. To round out your private tour of Aix en Provence, you may visit a confectionery for a tasting of candied fruits and nougats (optional; small additional tasting fee). Inquire about our favorite restaurants in Aix en Provence. Your Provence private tour will also take you in the Lubéron mountain range, a wild area in Provence with delightful villages like the hilltop Bonnieux, known as the Mont-Saint Michel of Provence because of its resemblance to that famous Abbey. You will be impressed by the harmony between nature and the stone architecture of the area. This Provence private tour also include the Lubéron, very interesting area historically, as it was the stage for struggles between Catholics and Protestants in the 16th century. Depending on the season (end of June but July is best), you will take the scenic route back, crossing colorful, fragrant lavender fields.